I've never written a book review before, but then again I haven't read nearly as many books as I'd of liked lately but I am definitely getting the reading bug back in my life again (at the worst possible time, 27 days until the deadline!). The Girl With All The Gifts is without a doubt the best book I have read in a long time (and yes, I've read Gone Girl & The Fault In Our Stars this year too...). It's utterly gripping from the very first page and even though I really tried to take my time and savour such a good book I devoured it whole in two days. 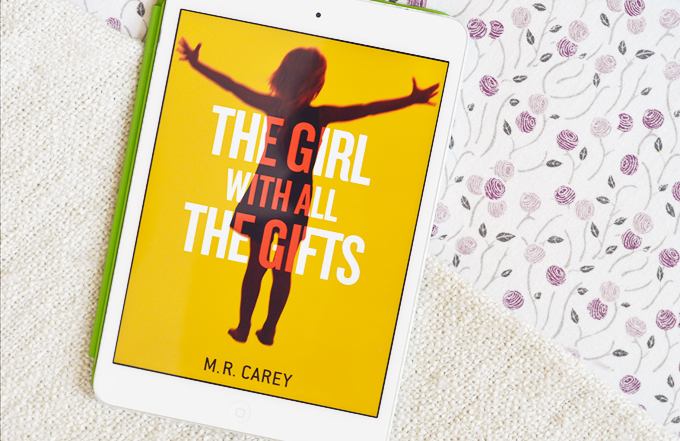 The Girl With All The Gifts is actually a zombie thriller, I know I know, don't click off just yet, because there is so much more to this book. I personally am a little addicted to the Zombie genre, don't know why but The Walking Dead is my favourite TV show ever, the idea of zombies fascinate me and I love nothing more than a good zombie film, I've watched them all and thought I knew all there was to know about this made up virus... But this book is completely different, the hungries as they are called in this book are quite terrifying, especially their origin. The level of detail and understanding that created them is mind-boggling and I'd tell you more but spoilers. The book is set from the point of view of a little girl named Melanie, she is the first character we meet and immediately we know something is wrong from her understanding of the world and where she is being held. It's been 20 years of fear for apocalyptic England, with what's left of humanity cowering on military bases. Melanie is in such a base, kept under lock and key with a group of other children just like her. The event that spurs the main storyline for the book happens very early on and from there the tension builds consistently until you realise you've been reading for a solid 6 hours and you're on the last page, with your heart in your mouth and perhaps a tear stain or two on your cheek. This is one of those books where the less you know the better before you dive right in, there are some genuinely heart warming moments, and even moments that make you rage, cringe and think WTF all at once. Also I've read here that it appears to be being brought to the big screen eventually and I couldn't be happier, it would make one hell of a film. I can't wait. "Every morning, Melanie waits in her cell to be collected for class. When they come for her, Sergeant Parks keeps his gun pointing at her while two of his people strap her into the wheelchair. She thinks they don't like her. She jokes that she won't bite. But they don't laugh. Melanie is a very special girl." What kind of books are you in to? I am currently reading the "World War Z" another zombie book! Haven't seen the movie, but from what I have heard its very different from the book! I'm such a bookworm and hated not having the time to read whilst at university, so glad this isn't the case anymore. Your review has got me gripped and intrigued. I now need to read this book so I can find out how the plot lays out. wwooow you have a great bloooog!!! and then I`ll follow back this favour sweety! I love book recommendations. I never would have looked twice at this one, but it's going on my to-read list now for sure!